Virginia Beach-based invention and design company Pancake Wheel LLC and inventor Rick Shapiro co-invented and co-developed the new state of the art “Nikimotion Blade” folding baby stroller unveiled at the 2015 “Kind and Jugend” (Kid’s) international trade show in Cologne, Germany. Pancake Wheel has been co-developing this new folding stroller design for two years since announcing the company’s patent licensing and design development agreement with Big Max Golf of Vienna Austria with factories also in China, in early 2014. Two years of painstaking product development and prototyping resulted in the unveiling of the Nikimotion Blade folding baby stroller at the 2015 Cologne trade show where the Blade received a highly positive trade show reception from buyers. The new Nikimotion Blade folds ultra flat, and features a new state of the art front handle, that serves to fold or setup all four stroller wheels so parents can stash the stroller in small spaces like closets or car trunks. The new European-based brand “Nikimotion” unveiled its brand new line of innovative baby stroller products at the 2015 Cologne trade show, and plans to expand distribution to the United States in the near future. Big Max has also recently begun distribution of golf products in the United States. The company has significant European market share in golfing products, including golf carts. Fold flat consumer product company Pancake Wheel LLC has a previous license with Radio Flyer wagons for Pancake Wheel technology as well as with Big Max Golf, and now with Nikimotion baby products. Shapiro and Pancake Wheel hold 18 USA patents and numerous Chinese patents, all in the field of folding wheel technology for consumer wheeled products. Pancake Wheel is planning to introduce a new line of “fold flat” patented plastic wagon products in the USA by 2016. Pancake Wheel LLC and inventor Rick Shapiro announce the company’s patent licensing and design development agreement with Big Max Golf of Vienna Austria. 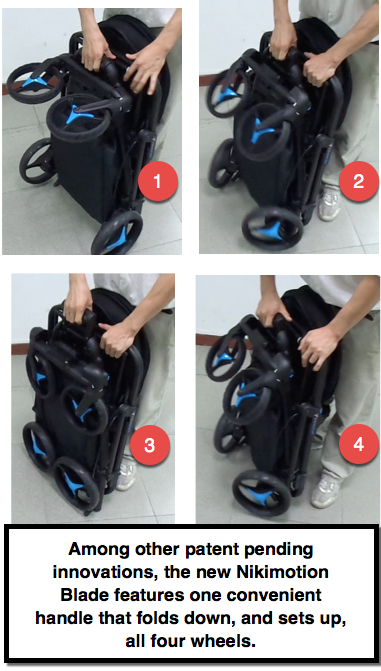 Pancake Wheel LLC will be licensing technology relating to folding wheel designs on three and four wheel consumer products, and will remain involved in design development on folding golf bag trolleys/carts as well as children’s stroller products. Big Max Golf is an international sporting goods company that manufactures and distributes golf products, based in Vienna Austria, and Big Max has recently begun distribution of golf products in the United States. The company has significant market share in golfing products including golf carts in Europe and beyond. The alliance of the companies and their staff plan to develop some of the world’s most compact, fold flat golf carts as well as baby stroller products, and related products relating to transporting kids. The baby stroller products are being sold under the Nikimotion brand in parts of Europe. Pancake Wheel LLC has a previous license with Radio Flyer wagons for Pancake Wheel technology and looks forward to working with Big Max and Union sports on exciting fold flat products. Pancake Wheel has signed a patent license agreement with Radio Flyer the USA’s largest wagon manufacturer-innovator of the renowned Radio Flyer “little red wagon”. The license agreement covers a fold flat handle design patented by Pancake Wheel LLC and inventor Rick Shapiro. The Pancake Wheel patented fold away handle design allows the Radio Flyer plastic wagon handles to fold inside the Radio Flyer wagon, and the design allows the handle to hold in intermediate positions so it does not drag along the ground. Radio Flyer has introduced the fold flat handle design on several new family friendly wagons and may expand the fold flat handle to additional Radio Flyer wagon models. Pancake Wheel’s designer Rick Shapiro is the inventor-lawyer of the technology behind the fold flat wagon/cart handles and wheels, and holds 15 U.S. patents, and numerous international patents, on folding wagon/cart designs, folding handle and wall designs, and related technology for numerous fold flat wheeled products, including the world’s thinnest folding wagons, folding carts, wheelbarrows & jogging strollers/joggers. Shapiro is an inventor-lawyer practicing lawyer with a Va. Beach, VA personal injury law firm, Shapiro, Lewis & Appleton. 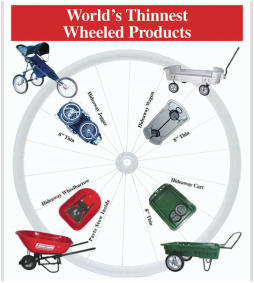 Besides the Radio Flyer license products, Pancake Wheel is now selling the world’s most compact, fold flat metal wagon/carts via online sales in the USA. The Pancake designed compact wagon/cart attains the world’s thinnest stowed profile (about 7 inches thin) and has the ability to quickly collapse and stow the wheels inside the base of the wagon/cart device. As of 2012 the products are selling on www.foldflatworld.com and on www.amazon.com . News Release - Spring 2009. Virginia Beach, VA - Pancake Wheel LLC announces that it is introducing two new fold flat carts/wagons that each fold flat to an amazing 6 inches thin, featuring 7 " no flat" cushioned tires. One of the products is an entirely steel/metal wagon/cart which will carry over 200 pounds on hard surfaces and is the perfect utility cart/wagon-with the bonus of folding up to 6 inches thin to stow in the car trunk or against any wall on a hook. The second new Pancake ® metal collapsible, folding cart product is the "Road Warrior," a cargo carrier/cart/wagon featuring two large metal fold flat uprights that help secure bulky, heavy cargo and serve as pull handles. This new "Road Warrior" cart/wagon is functionally a cross between a cart and a cargo/luggage styletrolley/cart and will move over 200 lbs of bulky cargo on hard surfaces-yet store 6 inches thin in a zippered carry bag. The new foldable Road Warrior Pancake ® cargo carriers are perfect for any traveler, musician, A/V business or vendor required to move cargo in and out of businesses, nightclubs, coliseums, theaters, trade shows or similar. The U.S. patent office has granted extensive patent protection to the new Pancake ® carts/wagons/carriers which sacrifice no cargo carrying capacity, compared to standard wagons/carts, but saves space and will fit in any car trunk or SUV. Pancake Wheel is seeking additional distributors and marketing agreements on these products. About Us: Pancake Wheel LLC is the leading innovator of fold flat wheel technology in the United States, having patented and designed the world's thinnest carts, wagons, jogging strollers/joggers, bike trailed child carriers and other fold flat wheel products, covered by 14 US patents, together with International patents granted and pending.Pancake ® and Compact Solutions are registered trademarks of Pancake Wheel LLC. Internet sale outlets include foldflatworld.com and cartsandwagons.com . News Release - Summer 2009. Release keywords: wheelbarrows, collapsible wheelbarrows, compact wheelbarrows, wheelbarrows that fold, folding wheelbarrows, fold up wheelbarrow carts, fabric carts that fold, folding fabric carts, pancake wheel wheelbarrows, compact wheelbarrows, travel wheelbarrows, parts of wheelbarrow store inside, worlds most compact wheelbarrow, fold up carts, fold up wheelbarrows, hang wheelbarrow on wall, hanging wheelbarrow. Virginia Beach, VA - Pancake Wheel LLC announces that it is introducing a plastic/poly fold flat, world's most compact solid tub/tray wheelbarrow during the summer of 2009 which will be marketed through Compact Solutions ® and other web-based retailers. The new Pancake Wheel compact wheelbarrows feature exclusive patented technology that allows all the folding wheelbarrow parts to store compactly inside the tub or tray of the wheelbarrow, inside a zippered carry bag.The small compact foldable, collapsible portion is moved from the underside of the wheelbarrow, to right inside the full size plastic tub/tray. Also, sold as part of the wheelbarrow unit is a zippered bag which secures the entire wheelbarrow inside the tray/tub. This allows the unit to be carried with a shoulder or hand strap, and the wheelbarrow unit may be hung flat against any wall such as in a garage with the included cable hanging loop.Or, the unit fits inside virtually any car trunk. The United States patent office has granted extensive patent protection to the new pancake wheel compact wheelbarrow which sacrifices no wheelbarrow cargo carrying capacity, compared to collapsible fabric style carts/wheelbarrows, but saves space and will fit in any car trunk or SUV. 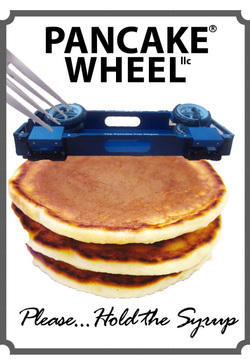 Pancake Wheel is seeking additional distributors and marketing agreements on this product. About Us: Pancake Wheel LLC is the leading innovator of fold flat wheel technology in the United States, having patented and designed the world's thinnest carts, wagons, jogging strollers/joggers, bike trailed child carriers and other fold flat wheel products, covered by 14 US patents, together with International patents granted and pending.Pancake ® and Compact Solutions are registered trademarks of Pancake Wheel LLC. Internet sale outlets will likely include foldflatworld.com and cartsandwagons.com . Pancake Wheel: read our blog on the best, fold up, compact travel carts, wagons, joggers, strollers and more! The world’s thinnest folding solid base carts and wagons, over 15 U.S. patents and counting. View all Pancake Wheel’s Youtube videos on fold flat carts, wagons, joggers here.